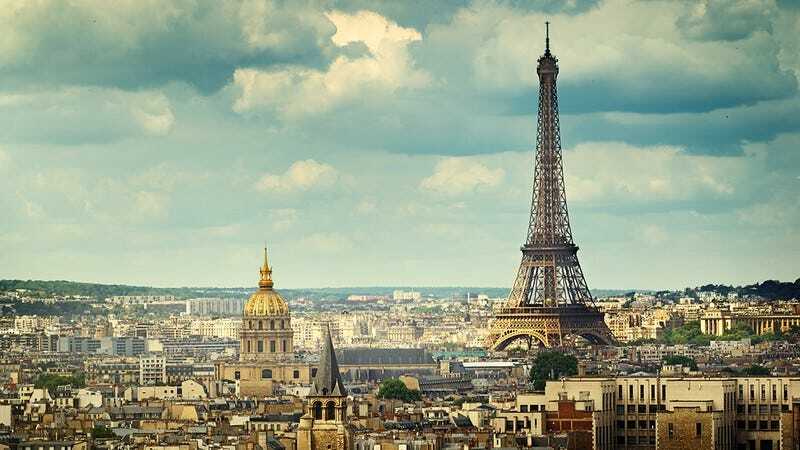 Paris is one of the world’s most beautiful cities, and if you’ve only got 24 hours to spend there, here are five things you absolutely must do. 1. Have a romantic evening picnic as you watch the Eiffel Tower zap birds: There’s a reason Paris is known as the City Of Love. If you want to impress your significant other, spread a blanket out on the ground in front of the Eiffel Tower and enjoy the show as herons, sandpipers, and owls flock from hundreds of miles away to dive-bomb into the iconic electrified tower and light up the night sky. Ooh la la! 2. Contribute to Notre-Dame Cathedral’s gum wall: Built in 1163, the Notre-Dame Cathedral is a triumph of French Gothic architecture and boasts one of the oldest gum walls in the world. Power-washed only once in 1336, everyone from Nostradamus to Coco Chanel has added their mark on the cathedral’s east-facing wall. Run your hand across the bumpy, multicolored stone and it’s entirely possible that you’ll be touching gum that once resided in the mouth of Joan of Arc. 3. Kiss Hemingway’s visage embedded in the trunk of a Pontiac Aztek: In a small museum in Paris’ Latin Quarter, book lovers can kiss the dented metal of the ’05 Aztek that Ernest Hemingway flew into after getting doored while biking in Saint-Germain-des-Prés. Things can get a tad touristy at the gift shop, where everything from shirts to Himalayan salt lamps are made to look like Hemingway’s famously immortalized open-mouthed scream, but the museum staff is knowledgeable and clearly proud to house such a precious piece of literary history. You won’t want to miss it. 4. Catch the orca show at the Louvre: Locals know that the best way to experience the Louvre is to blow past all the priceless antiquities and seminal paintings and head straight for the Louis XVIII Oceanarium to catch a presentation of “Arise: An Orca Experience,” where the museum’s twin killer whales, Guy and Gulliver, flip and twirl 20 feet in the air for cheering crowds of amazed spectators. Get there early if you want a chance to be the one lucky visitor who gets to stand at the edge of the tank and feed the whales fish. Oh, and word to the wise, be sure to wear a poncho if you don’t want to get wet. 5. Continue building the Arc de Triomphe into the John Candy statue it was originally intended to be: Commissioned in 1994 by then-French President François Mitterrand following Candy’s tragic death, workers only had time to build out the comedy legend’s two stocky legs before an economic recession forced construction on the memorial statue to be halted, leaving the structure without a torso, arms, or head. If you’ve got an hour or two to spare and would like to lend a hand, locals would undoubtedly be grateful if you could get started on the masonry work for the belly, as the people of Paris care very deeply about honoring the Uncle Buck star’s memory.